Kagiso Rabada's biggest moment in IPL perhaps came when he cleaned up Andre Russell in the Super Over to win Delhi Capitals a game they had nearly messed up. 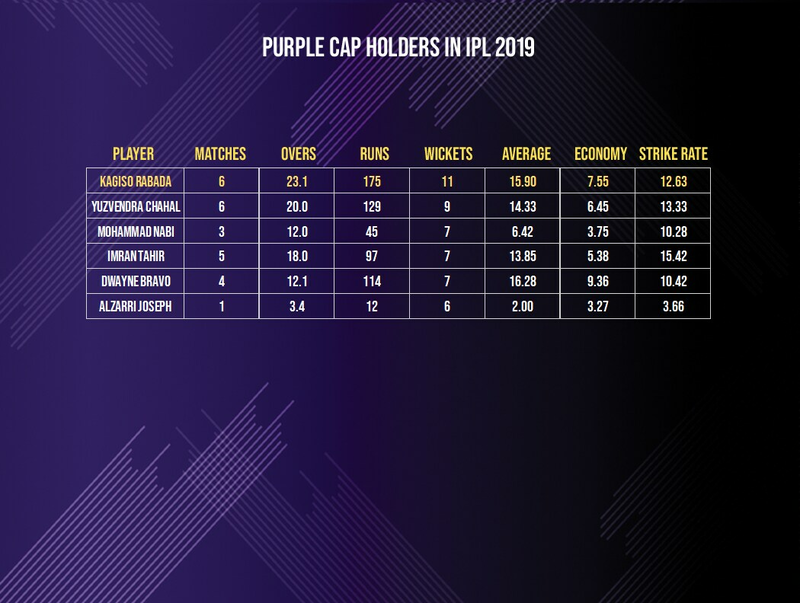 Topping that performance at M Chinnaswamy stadium against Royal Challengers Bangalore, Rabada grabbed a career-best 4/21 to get to 11 wickets in the season, the most by any bowler. 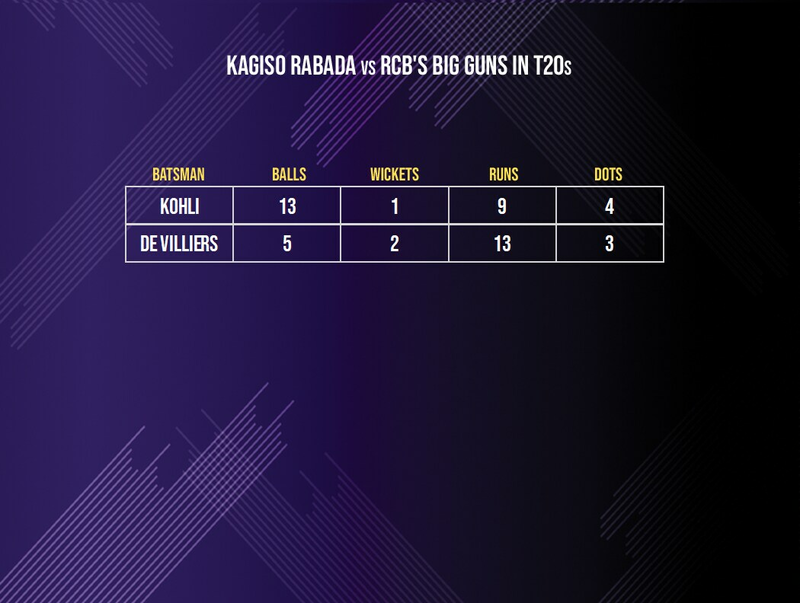 Rabada's spell pushed RCB down for he had removed two of their best batsmen in AB de Villiers and Virat Kohli. Rabada has been pretty good against both of them in T20 cricket. Against de Villiers, he had bowled just three balls prior to this match and had dismissed him once while conceding two sixes of the other two balls. On Sunday, he bowled just two balls, excluding a wide, at his South African mate and dismissed him with a slower length ball. Rabada had tried deceiving de Villiers with the slower ball in the previous delivery too but sent down a wide in the process. Against Kohli, Rabada has now bowled 13 balls in T20s, dismissing him once (this game) and conceding just 9 runs, a strike rate of 69.2. Kohli was undone by the ball stopping on him a touch and holed out while looking to go over long-on. This is Rabada's second season in the IPL after making his debut in 2017. He had missed the 2018 season owing to injury after picking up just 6 wickets in 6 matches in 2017 at an average of 31.33 and an economy of 8.81. This season, he is already proving why that year was an anomaly to his T20 numbers. He has 11 wickets already this year in 6 matches (the same number of games as in 2017) at a much better average of 15.90 and a pretty good economy of 7.55. He has been striking every 13th ball on an average compared to every 22nd ball in 2017. 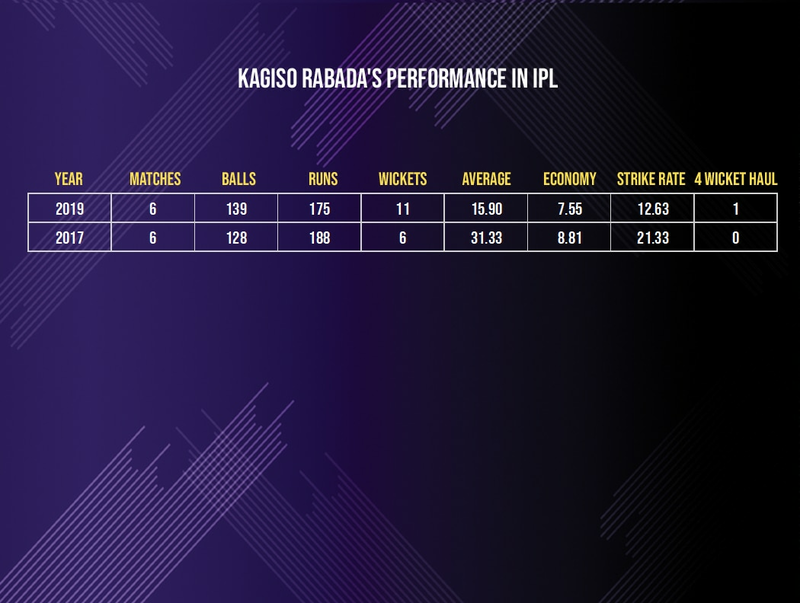 With this performance, Rabada now holds the purple cap in the IPL with 11 wickets. He is closely followed by Yuzvendra Chahal, Mohammad Nabi, Dwayne Bravo and Imran Tahir with seven apiece. His sensational start to the tournament should auger well for Delhi who were in search of a reliable strike bowler when they picked Trent Boult and Rabada himself. *Updated till Delhi Capitals' win against Royal Challengers Bangalore.